Watchnight Service - 11.30pm Christmas Eve.in St Andrew’s Church. 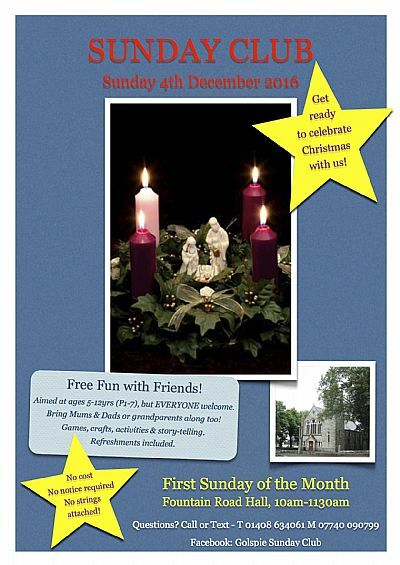 Christmas morning worship - 11.00am in St Andrew’s Church. New Year’s Day morning worship - 11.00am in St Andrew’s Church. Due to other commitments our cleaner has had to give up cleaning the church hall. We are looking for a new hall cleaner. If anyone would like to volunteer for the job or knows someone who might do so, please get in touch with Mary MacRae on 01408 633413. For the time being we will have a rota and if you would like to help please get in touch with Mary. Many thanks! LOCAL CHRISTMAS CARD DELIVERY SERVICE for only 25p per card we deliver your local Christmas cards. Pop your addressed cards, along with the money in a separate envelope, into the special boxes located at Benview Stores, AG Campbell Fish Shop, Mitchell's Chemist, West End Stores, VG-ES, St Andrew's Church. Last collection on 21 December at 3.00pm. A Nine Lessons & Carols service was held in Fountain Road Church Hall on Sunday 4 December at 7.30pm. Followed by teas with mince pies and Christmas cake. £197 raised was raised from the collection, this sum will be going to Christian Aid. Thanks to all who set up and attended the service. A Pancake and Cupcake Teas was held in Fountain Road Church Hall on Saturday 26 November 11am to 2pm with a variety of stall holders. In Aid of a new Dormitory at the Orphanage run by IVM. 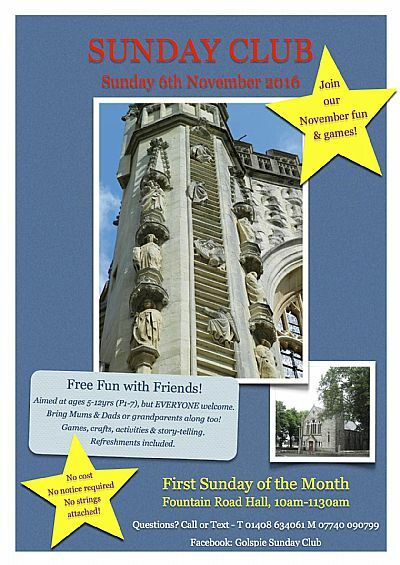 The Sunday Club was held on Sunday 6 November at 10.00am - 11.30am in Fountain Road Church Hall. 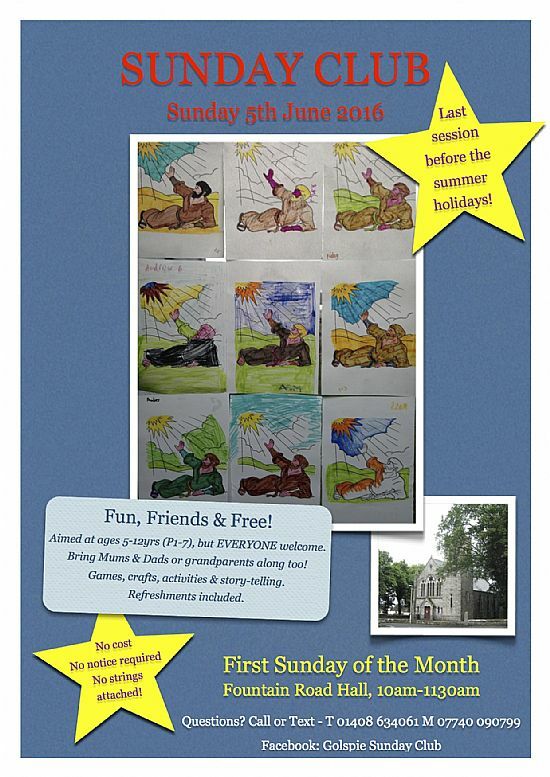 Ages 5 - 12 are welcome for stories, games, crafts, snacks and learning about the Bible. Under 5’s welcome but must be accompanied by an adult. Come along and bring a friend! The Wednesdaycommunion was held on Wednesday 26 October at 3.00pm in Fountain Road Church Hall, followed by refreshments. If you are considering joining the church, would like to know more and would be interested in attending an informational evening in the Manse please inform the minister or the session clerk (Mrs Isobel Murray). Leaflets are available on the bookboard with details of what to do if you wish to contribute to this cause. The shoeboxes are distributed to those on the margins of society, mainly in Eastern Europe, and are a tangible expression of Christian love to those that have so little. Smartie Tubes, take home a tube from under the thermometer in the church, eat the chocolates and fill the tube with coins. Return it to the church and place in the offering plate or in the slot under the thermometer. This is helping us pay our building insurance costs. We are exceedingly grateful to everyone who helps our church in this way! The Sunday Club was held on Sunday 2 October in Fountain Road Church Hall, 10.00am - 11.30am for children ages 5-12. Anyone under 5 is welcome as long as they are accompanied by an adult. 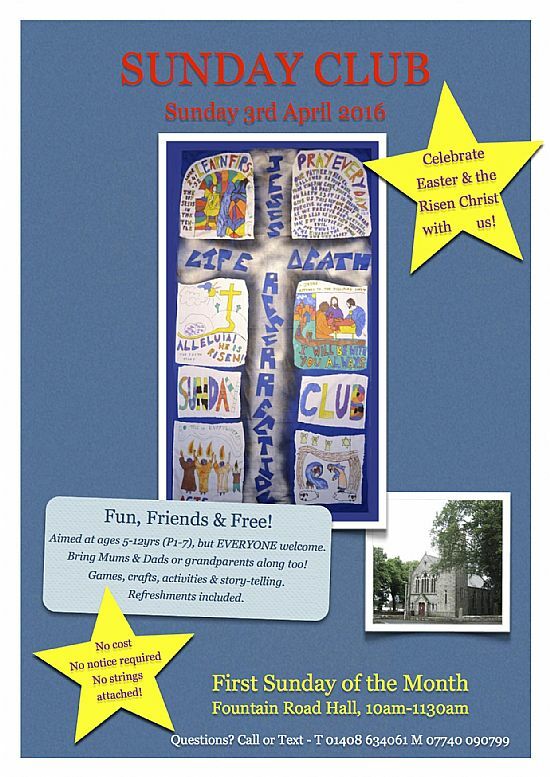 Bible stories, games, activities, crafts, snacks - come along and bring a friend! 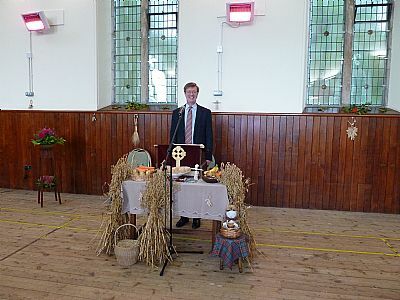 The Harvest Thanksgiving service was held on Sunday 25 September in Fountain Road Church Hall. 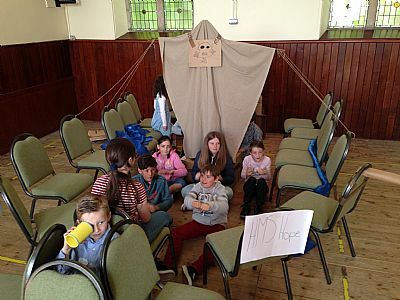 A group from the congregation had helped to decorate the Hall on the Saturday afternoon. St Andrew’s Church had been asked once again to participate in the Blythswood Highland Foodbank Appeal. The congregation has been asked to contribute Oatcakes/Crackers, Long Life Fruit Juice. 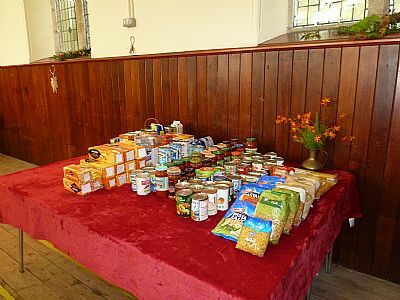 Tinned Ham, Tinned Rice Pudding, Pasta Sauces in particular, although any donations of food were welcomed. The congregation responded generously to the appeal. Thank you to everyone who participated in this appeal. The Bible Study in our current series, looking at a part of Luke’s Gospel, was held on Wednesday 21 September 2016 at 7.00pm in the Manse. Bible Study is open to all so please come along whether or not you have been before, all are welcome. 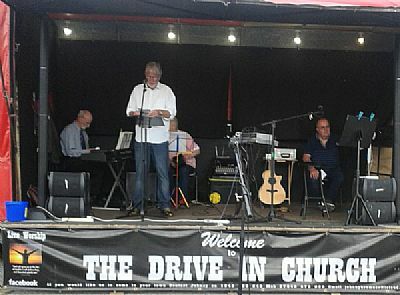 The annual Church Fete was held on Saturday 27 August and once again was well supported by the congregation and local community. The total raised to date is £1519. Many thanks to all who supported this event. The Joint Seafaring Songs of Praise was held on 21 August at 6.30pm at Golspie Harbour, sponsored by St Andrew's Church and Golspie Free Church. Over 100 people attended and £380 was collected in aid of the RNLI. The Bible Study in our current series, looking at a part of Luke’s Gospel, was held on Wednesday 17 August 2016 at 7.00pm in the manse. Bible Study is open to all so please come along whether or not you have been before, all are welcome. 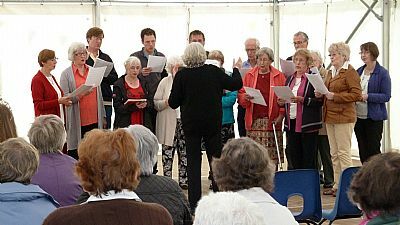 The Gala Week Songs of Praise was held in the marquee again this year and attracted approximately 75 people. A good time was had by all as the congregation chose their own hymns, listened to St Andrew's Choir and heard a short message by Rev John Sterrett and a prayer by Rev Eric Paterson. It was a worshipful, but lively start to Gala Week! 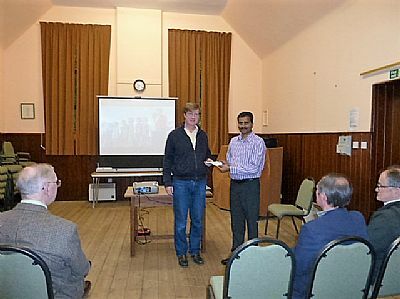 On Friday 29 July at 7pm in Fountain Road Church Hall, Suresh gave a presentation and update on the work of his ministry in India including the work on the new dormitory. Teas and home bakes were served and Suresh was presented with a cheque in the sum of £1,760 from the money raised at the recent Afternoon Tea Dance. We held an Afternoon Tea Dance on Saturday 25 June raising funds towards a new dormitory at the Orphanage for India Village Ministries. As we listened to the great sounds of Hula and the Hoops as they sang hits from 50's and 60's some of the smiling faces in the audience were seen singing and swinging along to their favourite songs. At the band's break time we were kept entertained by a display of Egyptian dancing from Morag, Eden and Pamela. We were then treated to a magnificent tea of home baked scones, pancakes and cakes which were all generously donated. After our tea break the band struck up again and this time some even found themselves up on the dance floor. A special mention should be given to Sandra for her magnificent effort with the donation sheet, which in itself raised £605 towards this total. Her ability to run an Auction of items donated also raised the sum of £228.80. This went together with the door money and raised the fantastic sum of £1,015 on the day. A further £745 has since been donated, making the final total £1,760. A big thank you to all who donated, and to those who came along to support the fundraiser. Watch out for news on our end of July visit from Suresh where we will get an up to date report on the work of his ministry. The Bible Study in our current series, looking at a part of Luke’s Gospel, was held on Wednesday 15 June 2016 at 7.15pm in the FRCH. Bible Study is open to all so please come along whether or not you have been before, all are welcome. CHOIR PRACTICE - Choir Practice resumed on Tuesday 7 June and 14 June at 8pm in the small hall Fountain Road Church Hall in preparation for our Communion Service on 19 June. SUNDAY CLUB 5 JUNE - Sunday Club was held on Sunday 5 June, 10.00a.m.-11.30a.m. 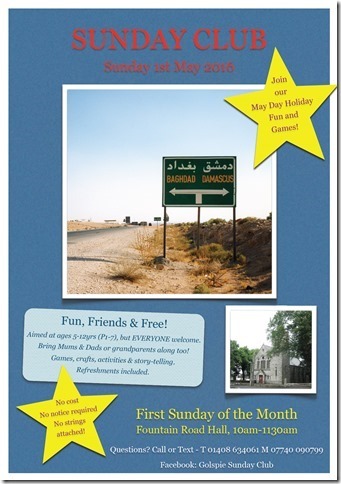 All children ages 5-12 and parents welcome! Anyone under 5 must be accompanied by an adult. St Paul shipwrecked off Malta. BIBLE STUDY 18 MAY - Following Jesus – Listening. The Bible Study in our current series, looking at a part of Luke’s Gospel, was held on Wednesday 18 May 2016 at 7.00pm in the Manse. Bible Study is open to all so please come along whether or not you have been before, all are welcome. GIFT DAY 7 MAY - Our recent Gift Day raised the magnificent sum of £3804.63. A big thank you to all those in the congregation and community who came along to support us and donated towards this total. This sum will go a great way to helping our church continue serving in our local community. BIBLE STUDY - 20 APRIL - Following Jesus – Love Your Neighbour. The Bible Study in our current series, looking at a part of Luke’s Gospel, was held on Wednesday 20th April 2016 at 7.00pm in the Church Manse. Bible Study is open to all so please come along whether or not you have been before, all are welcome. 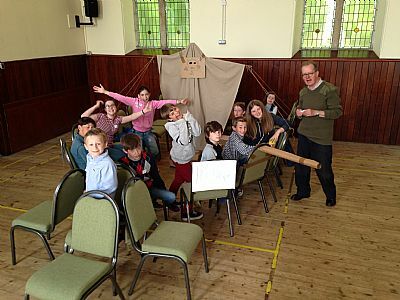 Mothering Sunday this year saw a hugely exciting development in the life of Golspie Sunday Club and our Church. Sunday Club held a special shortened session during which we were joined by the minister, parents and helpers to make gifts (fresh flower posies for ladies and goody bags for men!) for those who care for us. These were presented by the children to family members and the congregation during the first hymn. 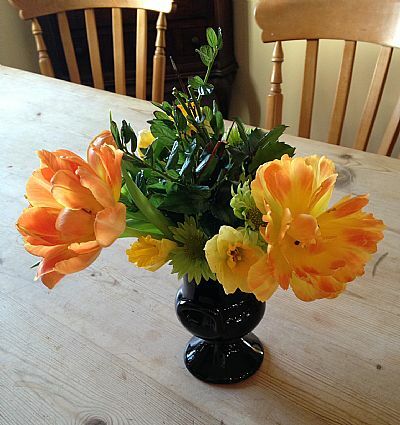 The photo is of a couple of the posies we made. This was immediately followed by a family worship service with a series of short readings and reflections interspersed with a congregational team quiz & interactive story. The general feedback has been incredibly positive and we were greatly encouraged by the number of families who chose to stay on for the service after Sunday Club. The ministry team will be working to see how we can build on this for the future. All suggestions are welcomed! Please contact the minister or myself, Henrietta Marriott with questions or for information. The World Association of Guides and Scouts celebrate World Thinking Day annually on 22nd February. This was the birthdays of both the Founder of Scouting Lord Baden Powell and His wife Lady Olave. On this day all the local units of Guiding and Scouting attend a church service alternating between the Free Church and St Andrew’s Church. 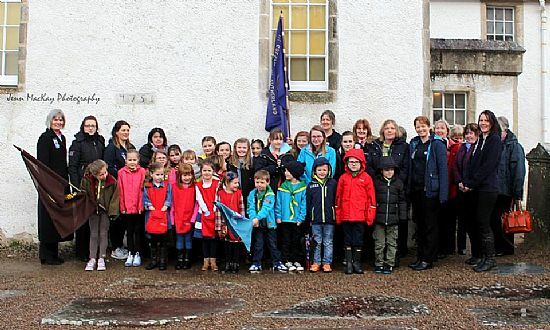 Rainbows, Brownies, Guides, Senior Section, Leaders and Trefoil Guild from Guiding along with the Beavers and Leaders from Scouts joined the Congregation at St Andrew’s Church on 21 February 2016. This year's theme was Connect - and that is certainly what the units did with the Congregation and Minister. During the first Hymn - Will your Anchor Hold, the Colour Party entered the church and presented the Rev John Sterrett with the flags. Readings and prayers were undertaken by Brownies, Guides, Senior Section, a Leader from Beavers and also a representative from the Trefoil Guild. When the Congregation were arriving at church they were given small heart shaped cards strung with coloured ribbon, and during the service they were invited by the Minister to write a prayer, thought or someone's name on a card. 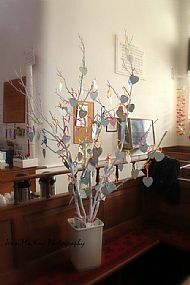 During the service the Rainbows collected the cards and hung them onto the branches of the prayer tree. The "tree" - carefully painted branches tied together and placed in a pot made a colourful picture alongside the flags of the units and the smart uniforms of the Guiding and Scouting units. From some of writings on the cards the children were certainly listening to the service. A number of the cards just had single names on them, others a little bit more, but the collective thought was Prayers for others. Some of the Guiding members were also members of the Primary School Choir who sang, These Bones going to rise again and Any Dream will do. The closing Hymn of Kum Ba Yah was followed by a Guiding Thinking Day Prayer and then the units followed the flag bearers out of the church. Following a quick photo call outside it was back into the warmth of the church for juice and biscuits and a cup of tea for the adults. The first Study in the Book of Luke in 2016 began on Wednesday 17 February at 7.00pm. in the Small Hall, Fountain Road Church Hall. Study materials are available and Bible Study is open to all so please come along whether or not you have been before, all are welcome. 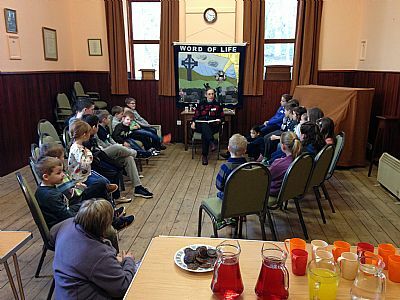 The first session of the Sunday Club in 2016 was held on 31 January in Fountain Road Church Hall. The story was the temptation of Jesus in the desert as Lent begins soon afterwards, and the theme was 'Lead us not into temptation'. Everyone welcome. Fountain Road Church Hall, 10-11.30am, Under 5s please bring a grown up with you!.